Monte E. Weiss | Weiss Law Office, S.C.
Monte E. Weiss is the founder of Weiss Law Office, S.C. His practice is devoted almost entirely to the defense of bodily injury, property damage, and products liability cases on behalf of insurance companies and self-insured entities. 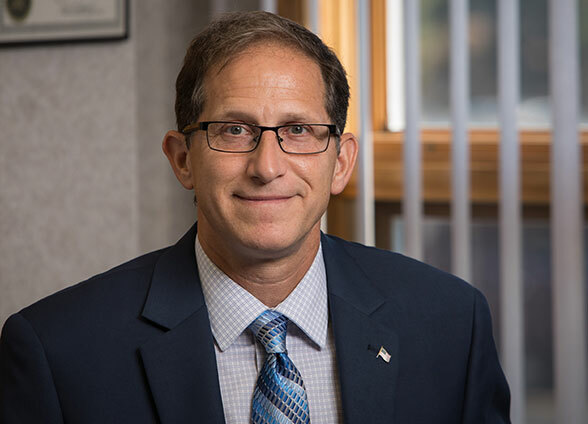 His courtroom experience includes numerous jury and court trials around the State of Wisconsin as well as arguing cases before the Wisconsin Court of Appeals and the Wisconsin Supreme Court. He routinely represents insurance carriers with respect to insurance contract interpretation issues, claims of bad faith, and other complex insurance coverage matters. Weiss has drafted several personal lines property and casualty insurance policies, including homeowner and automobile policies. In 2009, upon receiving a request from then Chief Justice Shirley Abrahamson to assist with the regulatory system that governs the conduct of Wisconsin’s attorneys, Attorney Weiss accepted. He has since served on District Investigation Committee Two of the Office of Lawyer Regulation. Weiss’ involvement with District Investigation Committee Two helps him to effectively serve his clients in the defense of legal malpractice claims as well as grievances with and complaints filed by the Office of Lawyer Regulation. Mr. Weiss has argued his clients’ cases before the Wisconsin Court of Appeals as well as the Wisconsin Supreme Court. As a result of these efforts, Weiss has helped shape and develop Wisconsin law on a number of critical issues that affect his clients. In addition to his efforts in the courtroom, he is also the author of many articles regarding insurance coverage and other insurance industry-related topics and is a regular speaker on these same issues. Mr. Weiss has been selected to the Wisconsin Super Lawyers list for a number of consecutive years. He was also recently recognized as a “top rated insurance coverage attorney.” Weiss is extremely proud to be celebrating his 15th year with the highest attorney rating possible in the legal industry. State Farm Fire & Cas. Co. v. Hague Quality Water, Int’l, 2013 WI App 10, 345 Wis. 2d 741, 826 N.W.2d 412 aff’d 2014 WI 5. Aaron Bain v. Tielens Construction, Inc., 2006 WI App 127, 294 Wis. 2d 318, 718 N.W.2d 240. “Issues in Wisconsin Discovery and Summary Judgment Practice,” Milwaukee County Circuit Court, December 15, 1995. “Subrogation: An Update on Some Recent Subrogation Cases,” Civil Trial Counsel of Wisconsin, Annual Convention 1998. “A Selected Update on Uninsured and Underinsured Motorist Coverage,” Milwaukee Bar Association, September 11, 2001. “Update on Uninsured and Underinsured Motorist Coverage,” Wisconsin Update on Auto Accident Litigation, Professional Education Systems Institute, LLC, December 18-19, 2001. “Avoiding Bad Faith in the Claims Stage,” Insurance Bad Faith Claims in Wisconsin, Lorman Education Services, February 28, 2002. “Wisconsin Insurance Litigation: UM/UIM, Subrogation, and Litigating Coverage Issues,” Professional Education Systems Institute, LLC, October 10-11, 2002. “A Selected Update on Uninsured and Underinsured Motorist Coverage,” Milwaukee Bar Association, November 12, 2002. “Uninsured and Underinsured Motorist Coverage: An Update & Subrogation: An Update,” Wisconsin Supreme Court – Civil Law Seminar: November 21, 2002. “Avoiding Bad Faith in the Claims Stage,” Insurance Bad Faith Claims in Wisconsin, Lorman Education Services, February 25, 2003. “Common Insurance Coverage Disputes: First Party, Third Party, Advertising Injury, Personal Injury, Contractual Liability, Reinsurance, Retrospective Premium and Subrogation Disputes,” Challenges in Wisconsin Insurance Coverage Litigation, National Business Institute, Inc., August 12, 2003. “The Previously Lost Economic Loss Doctrine,” Civil Trial Counsel of Wisconsin – Fall Convention; September 19, 2003. “Wisconsin Insurance Litigation: UM/UIM, Subrogation & Litigating Coverage Issues,” Professional Education Systems Institute, LLC, April 15-16, 2004. “Uninsured and Underinsured Motorist Coverage, An Update,” Wisconsin Supreme Court – Civil Law Seminar, December 1-3, 2004. “Avoiding Bad Faith in the Claims Stage,” Insurance Bad Faith Claims in Wisconsin, Lorman Education Services, March 22, 2005 and April 29, 2005. “Insurance Coverage for the Misrepresentation and Breach of Contract Claims,” Defending Against the Claim Related to Sale of Property, Civil Trial Counsel of Wisconsin, April 7, 2005. “Application of the Economic Loss Doctrine in the Construction Defect Case,” Defending the Construction Defect Case, Civil Trial Counsel of Wisconsin, April 8, 2005. “Getting the Most Out of Your Evidence During Wisconsin Personal Injury Trials,” National Business Institute, Inc., April19, 2005. “The Economic Loss Doctrine, How Far Does it Reach?” State Bar of Wisconsin – Litigation Section Seminar Annual Meeting, May 3, 2006. “Selected Issues for Worker’s Compensation Training,” Zurich American Insurance Group, Brookfield, Wisconsin, November 3, 2006. “Avoiding Bad Faith in the Claims Stage – First Party Claims,” Insurance Bad Faith Claims in Wisconsin, Lorman Education Services, March 31, 2006, March 30, 2007 and March 26, 2008. “Wisconsin Case Law, A Selected Update,” Wisconsin Claims Counsel, May 22, 2008. “Replacement Cost Coverage & The Appraisal Clause: Wisconsin Law After The Farmers v. Union Pacific,” Wisconsin Fire Loss Association, October 13, 2009. “Spoliation of Evidence: Wisconsin Law After American Fam. Mut. Ins. Co, v. Goelke Bros.,” Wisconsin Fire Loss Association, October 13, 2009. “Treatment of Payments for Medical Expenses in Third Party and First Party Claims,” Wisconsin Supreme Court – Civil Law Seminar: December 3, 2009. “Avoiding Bad Faith In The Claims Stage” Wisconsin Defense Counsel, Spring Conference, April 23, 2015. “Duty to Defend Issues” Panel Discussion, Wisconsin Defense Counsel, Spring Conference, April 24, 2015. “Wisconsin’s Disciplinary Process – An Overview”, Wisconsin Association for Justice, 2016 Summer Seminar, July 16, 2016. “Uninsured and Underinsured Motorist Law – Made Simple”, National Business Institute, December 6, 2017. “Common Insurance Coverage Issues In Car Crashes”, State Bar of Wisconsin – Car Crash Symposium, January 18, 2018. “Enhanced Injury Theory as a Defense,” Wisconsin Lawyer, November 1996. “Spoliation Of Evidence: A New Defense in Products Liability Cases,” Wisconsin Lawyer, May 1997. Book Review: “Falls and Related Injuries: Slips, Trips, Missteps and Their Consequences,” Wisconsin Lawyer, October 2003. “The Economic Loss Doctrine – A Coverage Defense?” Wisconsin Civil Trial Counsel Journal, Winter 2004. “The Expansion of the Economic Loss Doctrine Stalls: Tort Claims Based on Service Contracts Are Not Barred,” Wisconsin Civil Trial Counsel Journal, Summer 2005. “Real Property Transactions: Are Misrepresentations Insurable?” Wisconsin Lawyer, October 2005. “Wisconsin’s Economic Loss Doctrine – An Update,” Milwaukee Bar Association – Messenger, November 2005. “Appraisal Provision Validated: Setting the Amount of Insured Loss,” Wisconsin Lawyer, February 2010. “Lessons from Casper: Expanded Recovery for Injured Litigants.” Wisconsin Lawyer, March 2012. “Equal Voice Confirmed: Worker’s Comp Carriers Can Compel Settlement.” Wisconsin Lawyer, May 2012. “What is a Protectable Mark?—A Focused Primer.” Wisconsin Civil Trial Journal.Summer 2015. Wick, W. & Weiss, M., “Trial Practice Series – Protecting the Record: To Object or Not to Object, That Is the Question”, Wisconsin Defense Counsel Journal, Winter 2017. Piehler, D., Dieckman, A., & Weiss, M., “Pleading the Fifth – Civilly Speaking”, Wisconsin Defense Counsel Journal, Winter 2017.